This blog is referring to Collaborative Forecast, not the older Customizable Forecast, although in the setup menu, it just called Forecast only. For org created before Winter '12 release, you need to reach Salesforce support to enable Collaborative Forecasts. To start using Forecast, you have to enable all users will use forecast in user detail called Allow Forecasting. Then define Forecast Hierarchy from the setup menu, choose one or more Forecast Types, and specify other forecast settings, such as Quota, Forecast Category, fields to display in the list of related opportunities and etc. To enable forecast number roll-up to forecast manager in higher role hierarchy, Allow Forecasting must be enabled for the manager and all subordinate users. 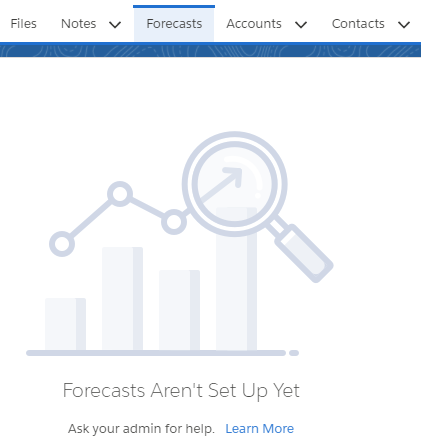 For users without Allow Forecasting enabled, when users click Forecast tab, that user will see Introducing Forecasts page only. When manager clicks Forecast tab, numbers from users without Allow Forecasting enabled will be not shown in the Forecast tab. Navigate to user detail page to enable it. Forecast Hierarchy is entirely based on the role hierarchy, but you also need to specify which user is the forecast manager for each role. The forecast hierarchy is automatically generated based on your Salesforce role hierarchy. Users without Allow Forecasting will not be shown in the forecast manager selection dropdown value. You can enable users for forecasting from Forecast Hierarchy, this will automatically tick Allow Forecasting in user detail level. Only one user can be assigned as Forecast Manager in forecast hierarchy, this user will see all forecasts and adjustments from the manager's subordinates in the hierarchy roll up into his or her Forecast tab. Other users in the same forecast hierarchy will see only their own numbers. 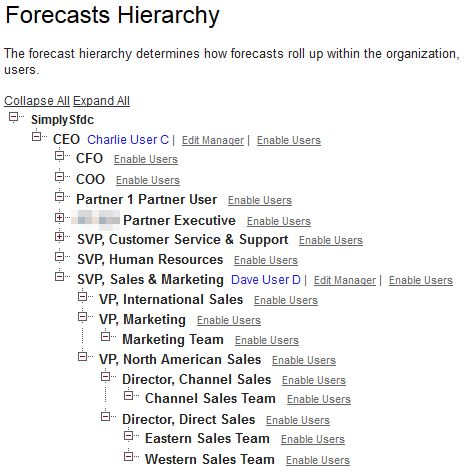 If no users are assigned as Forecast Manager in a Forecast Hierarchy, or no users at all in the role hierarchy, the number will not roll-up to the user in higher forecast hierarchy. Omitted will not be shown here as it considers has been lost. A forecast category is a category within the sales cycle that an opportunity is assigned to based on its opportunity stage. The standard forecast categories are Pipeline, Best Case, Commit, Omitted, and Closed. You can customize forecast category names for your organization from Setup | Customize | Opportunities | Fields | Forecast Category. But, you cannot add or delete them. Once the value re-label, the new label will be used in Opportunity page layout and in Forecast tab. You can map Forecast Category value with Opportunity Stages values so each stage of opportunity will have a direct map with forecast category which will be shown in Forecast tab. You can hide this field page layout, so user not able to manually modify Forecast Category.